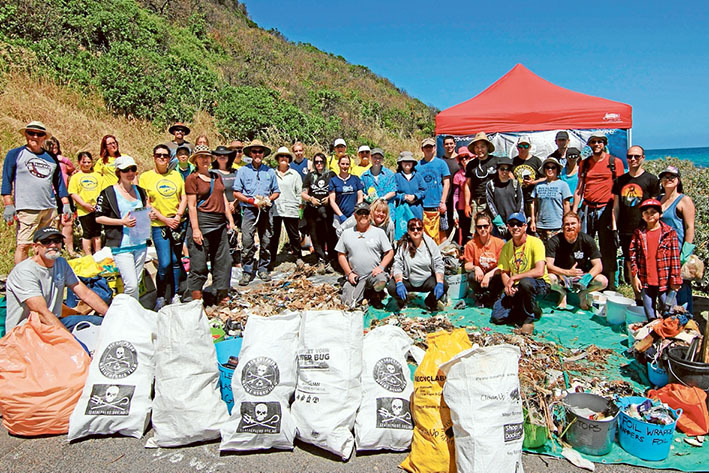 Message in a bottle, glass and litter: Frankston Beach Patrol and Sea Shepherd volunteers cleared away more than 146kg of rubbish at the foot of Olivers Hill. MORE than 500 bottles and 118 shopping bags weighing more than 146kg were removed from the base of Olivers Hill during a recent clean-up day run by Frankston Beach Patrol. The volunteer organisation picks up rubbish every month from different locations along Frankston’s coast line, and this month conservation organisation Sea Shepherd Marine Debris Campaign volunteers helped the group pick up rubbish. Frankston Beach Patrol manager John Billing said Sea Shepherd’s Trent Williams contacted him a few months ago and asked if they could join us for one of the patrol’s clean-ups. “Knowing that Olivers Hill can be particularly challenging, we didn’t hesitate to take them up on their offer,” said Mr Billing, who formed the group, part of Beach Patrol Australia, two years ago with Frankston Council’s help. Mr Billing said the vast quantities of litter regularly picked up along Frankston beach shows Victoria needs to introduce an incentive for consumers to return containers. “Aside from people being more responsible for their own litter, with over 500 bottles alone removed from this one site in just one hour, it shows Victoria really needs to follow the lead set down by other states to introduce a container deposit scheme,” he said. To get involved register at beachpatrol.com.au or call John Billings, 0414 090 767.